It’s 1979 and Marvin has left his wife Trina for a man named Whizzer. Marvin is trying to maintain a tight-knit family, somehow hoping to keep his wife and his son and his lover happy. His psychiatrist, Mendel, seems to be helping, until he falls in love with Trina. William Finn’s Falsettos is somewhat of a cult musical; though it has been on Broadway twice, both runs were quite short. Finn is probably best known for The 25th Annual Putnam County Spelling Bee and his most recent Broadway musical was an adaptation of Little Miss Sunshine. 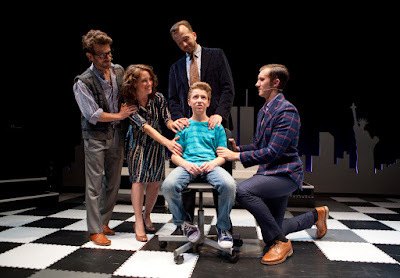 Falsettos is, in fact, a combination of two shows that originated off-Broadway at either end of the 1980s, March of the Falsettos and Falsettoland. March feels like Stephen Sondheim’s Company, a kaleidoscope of songs from people who know the slightly-unlikable main character. Falsettoland has a more traditional story arc and while as a second act, it’s only set two years later in 1981, the world had changed dramatically for gay men when it was first produced in 1990. The show is effectively a story and a sequel to that story. Two books separated by an intermission. And StageArts’ production is brilliant. In a show as lyrically complex and demanding as Falsettos, an intimate production is fitting. The “small band” is a solo pianist (David Butler) who gets quite the workout over the two-hour plus running time. 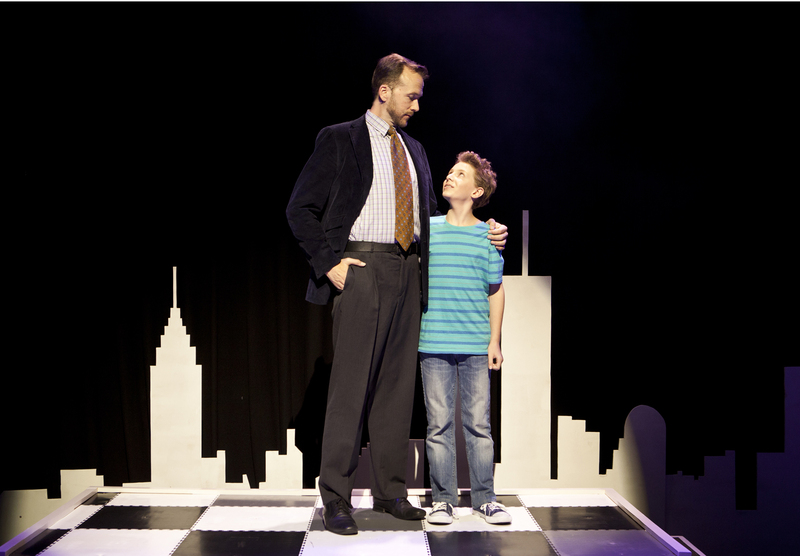 The set is minimalist, a black and white silhouette of New York, alluding to the chess that son Jason likes to play (though it’s hard to look at a chess board set in a musical and not think of Chess, which is the wrong mood the be in for a show like this). There were a few technical hiccups on opening night with missed lighting cues, but that’s a minor issue when everything else is so strong. Director Tyran Parke keeps the pace up throughout the show, with some rather impressive theatrical trickery that effectively digs into the characters’ moods and psyches. Choreography by Madison Lee is stunning throughout, most memorably in “Everyone Tells Jason to See a Psychiatrist” and “The Baseball Game”. Exciting stuff. The cast is superb and it feels like they’ve been living with these characters for a long time. Sarah Shahinian’s Trina is the backbone of the first act and her two solo numbers are striking and heartbreaking. In a show that feels like a storm, with a family’s lives turned upside-down, Trina’s spotlight moments are intimate but no less complicated and messy. Shahinian’s performance is mesmerising. Psychiatrist Mendel is central to the complicated machinations of the plot but in lesser hands could have been forgotten at the fringes of this show; with Nick Simpson-Deeks in the role, this was not allowed to happen. His conflicted psychiatrist is fascinating; Mendel is both in and out of control. Simpson-Deeks shows us the inner workings of a man trying to help this family while also falling in love with Trina. He’s incredible. Ben Jason-Easton is as great a performer as you’d want in the role of Jason, the son whose dad has come out and whose therapist is falling in love with his mother. Jason is at the heart of the second act, suffering through a more complicated adolescence than most. Jason-Easton knows his stuff; he makes us laugh and makes us hurt. His performance is remarkable. Marvin feels like a narrator to his own life until late in the second act, when he must confront the failing health of his partner, Whizzer. 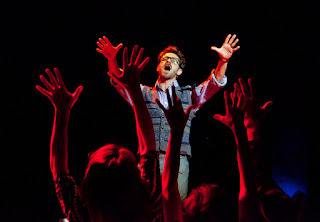 Falsettos feels much like a frantic comedy with the occasional dramatic beat until deep into Falsettoland when Whizzer is dying from the unnamed AIDS. It’s 1981 and at the beginning of the crisis; this family’s life, as if it wasn’t already a mess, takes a darker turn. Don Winsor and Sam Ward make a fine pair; their relationship is always complicated but they move in ways that make Marvin and Whizzer seem perfectly suited to each other, even when they are breaking up. “What Would I Do?” is a beautiful, tear-inducing finale that the actors nail. Falsettos is a remarkable tale of unconventional and found families set at a time when this story could have quickly torn them apart. And in this production, it never hits a false note. The show runs as part of Midsumma at Chapel Off Chapel until Feb 11.